Designed for photonics alignment applications, the H-811.F2 hexapod provides 6 degrees of freedom, 5nm actuator resolution, and 60nm repeatability, while providing velocities to 20mm/sec. Sustaining loads to 5kg, the hexapod features a removable magnetic kinematic plate to accelerate workflow with different fiber optics components. Its compact size, travel range up to 34mm for linear motions and up to 42° for rotary motions, and user programmable pivot point facilitate work with fiber optic and photonics components. It includes a controller with built-in multi-axis alignment routines for automatic alignment tasks. Various sizes are available with bases ranging from 50mm to 1m and load capabilities up to 2 tons. All 6 axes can be commanded as Cartesian coordinates, and the center of rotation can be changed on the fly. The Autoclave Medical Switch series adheres to industry sterilization standards, protecting patients from risks associated with reusable tools. Autoclave cycling sterilizes the device after exposure to bacteria, viruses, fungi, and spores. An autoclave cycle reaches 135° C, under pressure, for up to 15 minutes. The line features IP67 sealed switches that are biocompatibility tested and suitable for mission-critical medical devices. The KSR, ATS, and KMT series are also autoclave safe, gamma sterilization compatible, and EtO sterilization safe. PEM TSO4 self-clinching threaded standoffs securely stack or space components in ultra-thin stainless-steel assemblies. Hardened stainless-steel fasteners clinch into stainless sheets as thin as 0.025” (0.63mm) and become permanent parts of an assembly. Standoffs reduce hardware in an assembly, promote thinner and lighter designs, and minimize handling issues with loose hardware. The thread design at the barrel end minimizes the length for a mating screw. Thread-type variations with a thicker wall can be specified for increased bearing surface of the mating component or panel. For applications in potentially corrosive environments, an optional nickel plating can be added for corrosion resistance. PEM TSO4 standoffs are available in thru-threaded or blind threaded versions and in various lengths and standard thread sizes (#2-56, #4-40, and #6-32 / M2.5, M3, and M3.5). Specifications, fastener drawings and 3D models, and performance data (Bulletin SO) for fasteners are available at www.pemnet.com. Single-coated medical extended wear adhesive nonwoven tape on liner (3M 4077), is a pressure-sensitive adhesive that offers omni-directional stretch for conformability and breathability. The thin, water-resistant tape offers initial skin adhesion, and a 14-day wear time, and improved conformability during long wear times. An extended-wear adhesive is combined with a white meltblown elastic nonwoven backing on a silicone release liner. It is EtO, E-beam, and gamma sterilization compatible. Compliant with ISO:10993 sections 5 and 10, 3M 4077 is approved for use on intact skin. Dymax See-Cure and Ultra-Red fluorescing technologies. Dymax adhesive solutions will be cured with the BlueWave LED Flood curing unit and the MX-250 high-intensity LED spot-curing system. Designed as an add-on for collaborative robots, the plug-and-play collaborative vacuum tool (CRVT) end effector can maximize end-of-arm tooling flexibility. 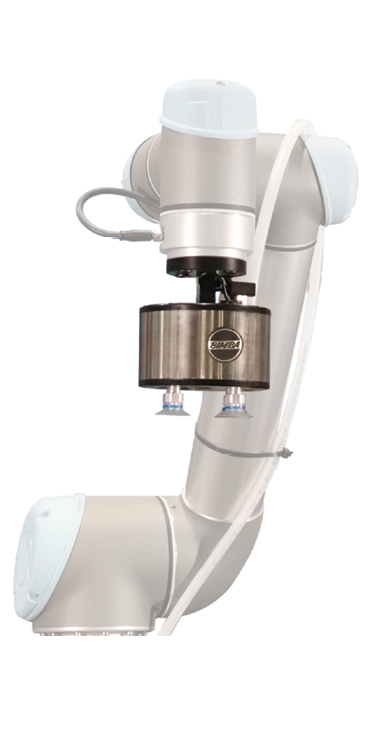 Without additional software, controls, or external valves, the CRVT connects to the robot, supplies it with air, and handles various sizes, shapes, and weights without changing settings. The CRVT integrates directly with Universal Robots systems for simple set-up, programming, and operation. Standard features include a Venturi vacuum pump, valve, vacuum switch, muffler, and cups. CPMT telescopic pillars for integration into surgical tables, procedure chairs, and similar medical equipment enable optimized access for patients, support heavier loads, and deliver safe and efficient lifting. Plug-and-play systems combine a 320mm (12.6") retracted height with up to 600mm (23.6") stroke range to improve accessibility for patients without compromising extended height. Other capabilities include a load-carrying capacity up to 6,000N (1,350 lb), positioning speeds up to 34mm/s (1.34ips), and the ability to access pre-set positions for overall clinical efficiencies. CPMT pillars are tested and UL certified according to IEC 60601-1:2005.